October 8, 2013 by Venky. It was early this year during one of our regular training rides that Dipankar Paul told me very casually about all the events that he has signed up for this year. It had 4 Ironman events, one Enduroman triathlon event with double Iron distance and another Enduroman event that is triple Iron distance. I didn’t know what to say! To say he is crazy would be an understatement, clearly! During the course of the year, he completed 3 Ironman events(France, South Africa and Zurich), cancelled registration to the other(US) due to logistical issues, attempted the double Iron distance event and DNFed due to lack of nutrition planning. When one of his friends lined up for the job confirmed that he couldn’t make it, he asked me if I want to be one of the crew members for the biggest event he’s participating in so far, the Enduroman LLD, 540km bike, 11.6km swim followed by ~130km run, where having a support crew was mandatory. My pal, Dipankar Paul’s version of fun! I said yes, but I wasn’t sure if I would be a right person for the job. I didn’t have any great endurance credentials and my knowledge is theoretical at best when it comes to Ultra-endurance. I’m into shorter distances and faster races necessitated by a family to rush back to. My longest bike ride at that time was a 250km ride. When he said that the other two crew members, who will be joining us from London, were riders who rode RAAM team event twice(2010 & 2012) and one of them was an Olympic level rower who represented his country in multiple Olympics, I felt a little better knowing that he is not going to in the hands of a completely incompetent crew. Fully aware that I was the weakest link in the team, I tried to do whatever research I can in terms of nutrition needs for such ultra-endurance events. My main focus was nutrition because I know he is strong/crazy enough mentally and physically to endure the event and finish it. Barring any serious injury, I thought, he will be able to finish it if we took care of his energy needs. Dipankar Paul with Enduroman race director, Eddy Ette at the start line! The Beginning At The End..
We reached London on Wednesday(25th Sept) and took an overnight train to Penzance and then a taxi to Land’s End and got there on Thursday. We had a couple of days to spare to acclimatize ourselves with the cold weather. We did a short ride for shopping from Lands End to Penzance and back, which gave us a taste of the short double digit grade climbs that took ones breath away. The first half of the 540km bike leg is peppered with hundreds of such short steep climbs. I was glad that I was crewing rather than riding. The pre-race briefing was held at Land’s End Hotel on Thursday(26th) where, Olympic rower and two time RAAM team event finisher, Jonathan Spencer-Jones joined us. Jonathan was to be crewing for the bike segment along with me while his elder brother, Nick Spencer-Jones, who rode with him in the two RAAM team events, was to take over from him during the swim and stay through the end of the run leg. Having them both was a blessing since along with the experience participating in endurance events, they bring their cars as support vehicles and know how to drive on the UK roads. During the briefing and the pre-race lunch we got to know that out of 40 odd people who showed interest and 10 people who confirmed, only 7 crazy athletes made it to start line of the event along with their support crews. The wind chill and the poor midday visibility seemed to predict the tough weather conditions of the coming days. Knowing that there were strong headwinds predicted for the next day, three riders- Andy Moore, Paul Gosney and Judith Martin, decided to start around 4pm on Thursday with a few minutes of gap between them. A couple of guys, Rod Elder and Paul Parish, have decided to start 2:30am on Friday(27th Sept). Our initial plan was to start 6am on Friday but we have reassessed the situation and decided to start at 4am. After last minute shopping and an evening spent familiarizing ourselves with the route and loading our Garmins with the bike route map, a few hours of nervous sleep, we got to the start line and started at 4:30am on Friday. We later learned that the youngest of the competitors there, Dave Kershaw, had started 50mins behind us at 5:20am. Eddy flagging off DP at 4:30am on Friday.. The different start times of the athletes were influenced mainly by the swim window which opens by 9am on Saturday(28th Sept) and closes by 5pm the same day essentially giving an 8 hour window. For example, if an athlete needs 6hours for his 11.5km swim, he should be looking to get to the pool at least by 11am on Saturday or he would be missing the cut-off for swim. Based on this and the estimated time for their bike legs and any planned rest breaks etc., the athletes get to work their way back and decide on a start time. Our 4:30am start meant we had 28.5hrs until the pool opens and a good 30hrs until we get into any inkling of trouble, as DP estimated that he needs at least 6hrs for the his swim. We figured we should be alright if we got to the pool by 11am on Saturday. That we thought is plenty as DP was sure he could do it in 24hrs. So, the rest was buffer time for any extra rest breaks and navigational errors etc. Where The Wind Whistles..And Growls.. Considering the fact that there was considerable elevation gain in the first half of the ride, he was making good progress in the first 5 hours before he took a break to stretch and have some muesli and yogurt. We took stock of the speed and our target times around 11am, 6.5hrs into the ride and saw that we were already 50mins behind schedule. 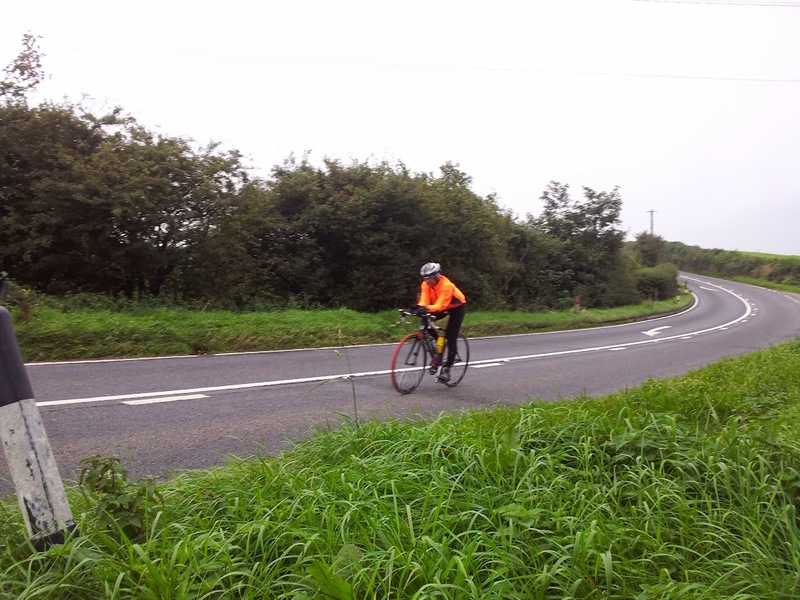 But we re-estimated our targets taking the strong headwinds and the current riding time he was taking on the climbs. First break around 9:30am where Jonathan helped him with a few stretches..
As we passed through Dartmoor National Park, the wind was unbelievably strong at around 40kmph. He was making crawling progress on the uphills which was okay but he was barely able to pick up any speed even on the descents as the wind kept pushing him back. Some hills were completely barren and exposed to the wind. There was nowhere to hide from those terrible winds which seemed to be growling angrily at us rather than whistling gently through the woods. We could not even stand outside the support vehicle for long without being pushed about or feeling extremely cold. All this meant our re-estimates also ended up being over estimates. We needed to be at half way mark(~170mi) by 5:30pm but were able to cover 155mi. The targets were quickly being reset according to realities. In the meantime, around 3pm or so on Friday we came across Paul Parrish who started a couple of hours ahead of us with Rod Elder. It was encouraging to other participants but it looked like he was struggling to make progress. We later got to know that he gave up on the bike leg but went on to finish the swim and the run in descent time. Beautiful country roads were part of the most of the route..
With all the Muesli and yogurt Dipankar was eating along with the perpetuem drink, he needed to be using the washroom once in a while. We found a pub by the road-side which was aptly named Wind Whistle Restaurant and flagged him down so that he could use the toilet. After he relieved himself he complained of pain in the right knee wanted to nap for a while. The first inkling of doubt crept into my mind when I saw how bad his knee was as he struggled to get out of the car and get on the bike after an hour of rest. Before the journey, he did tell me about what seemed like an ITB issue he experienced on his ride back from Mysore three weeks before the event. We hoped it wont make an appearance during the event since he was alright on subsequent rides to Nandi etc. But its appearance here barely halfway through the bike leg didn’t augur well. But we put lights on his bike and sent him off hoping it would subside and he will be able to make progress. The next few hours was surprisingly good in terms of progress. He seemed to be spinning better and the knee seems to be slowly sorting itself out. Jonathan and I were taking turns to catch a few winks for a couple of minutes at a time when we hop ahead and wait for Dipankar to pass us before we leapfrog him again. Around 11pm we stopped at a spot and were waiting for him as Jonathan was taking his turn to catch a couple of minutes of sleep. I had the spare bottles ready with drink and was staring into the darkness and happened to close my eyes for may be a few seconds. After I opened my eyes we kept waiting for him but it seemed to take a lot of time. We decided the 5-6miles we were ahead by wouldn’t take this long and he must have moved ahead during those few seconds when I dozed off. We were reluctant to call him often as he was having trouble picking up calls with his full finger gloves. We moved ahead to look for him and took a wrong exit at a round about. There was no way we could turn back even if it was only few hundred meters that we got ahead on the road. We finally found a small arterial road through the fields that connected to the road we had to be on and took that road. Just then it started raining and the rain gear for DP was in the car. I began to curse myself for that navigation miss and those few seconds of slipping into sleep. When we finally joined the correct road, we were not sure if he would be ahead of us or behind us. We gambled on going ahead but only to realize later that he was behind and waiting for us for the rain gear. It was only about 5-10 mins lost with him waiting for us in rain but it was very frustrating knowing that I could have completely avoided it. He has put on the rain jacket, shoe covers and moved on after having a some muesli and yogurt. 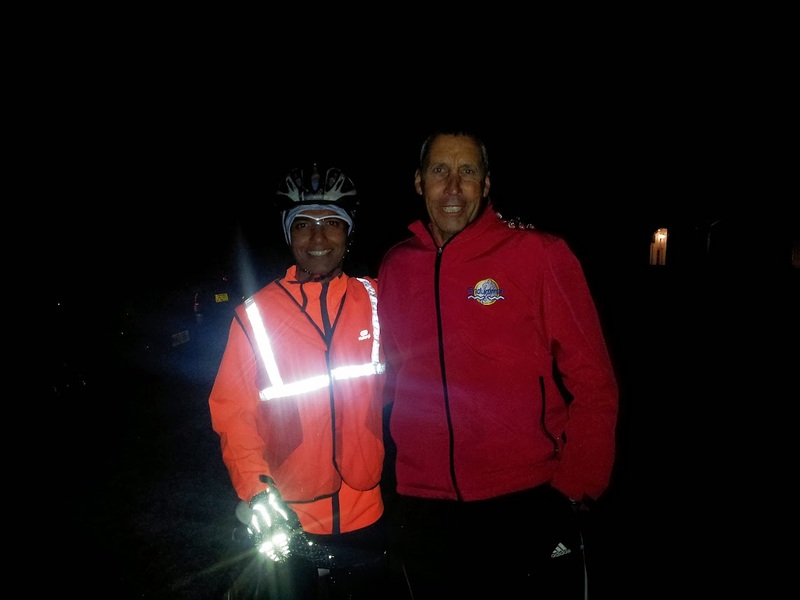 Around 3am on Saturday, Dave Kershaw who started 50mins behind us met us and moved ahead after a few words with Dipankar. We continued to see him on the route from time to time till the time we got to the pool almost at the same time. About 7:30 in the morning with about 35miles to go our Garmin file put us on M3, a motorway, we had no business to be on. Consulting our paper maps showed us the mistake we did and we turned back to get on the correct route. It cost us around 30mins in time and a lot more in frustration. It was clear now that we are not going to make it before 10am. Even if we made it by 11am, it means DP has to get into the pool without any rest and look to complete the swim in 6hrs that he initially estimated. We were hoping against hope that the Sunday morning traffic through London will be kind to us and not make our already slow progress even slower. As it turned out, we got to London and to the point where our Garmin maps ended, but that was not our destination. We had to still go some 10miles through the city to reach other end where Charlton Lido was. We put the postal code in Jonathan’s car’s GPS and started crawling towards the Lido in terrible traffic. Dipankar can be considerably faster through the traffic but we had the navigation and he was slowed down by us. As we crawled in the traffic, 11am came and gone, 11:30 was not to be and we finally made it to the pool about 12:15pm. With about 4 hr 45 mins left for the swim cut off, the plan and all the estimates have gone completely awry. The actual statistics from the bike leg indicated a 6050m of accumulated climbing for the 540km ride. It is almost 2/3rds of the elevation gain we had for the entire Tour of Nilgiris last year. Interestingly the distance was about 2/3rds of what we covered in TFN. Only, this ride was nonstop in one day. The tough terrain along with the strong headwinds, the chill factor and the rains added to the complexity. Add to that, the avoidable navigation errors and terrible traffic, we had recipe for disaster. My friend Ravi Kiran Chaliki helping Dipankar get into the wetsuit for the swim..
Dipankar was understandably pissed off and went into a daze, barely talking. He just went through the motions of putting on the wet suit and got into the pool as quickly as he can. We all knew there was no way he could complete the swim in the time available coming right off the bike. For him to be able to do it, he has to repeat his personal best IM swim time of 1:26:07, which he did at the start of a Ironman event with fresh body. He has to repeat it not just once but three times, without breaks but now right after a 540km bike ride. He decided to give it his best shot anyway. The participants during their swim.. The initial hour or so of the swim was quite slow with him trying to keep the arms rotating. He seemed to be going in slow motion. It was difficult to watch him struggling. By this time Jonathan’s brother Nick has joined us and so did my friend Ravi Kiran Chaliki to help us. They were beside the pool and asked me to take a nap in the car. I went and took a 30min nap. When I came back, I could see a sea change in the way Dipankar was swimming. He was going much faster than those who were swimming in his surroundings, putting distance on them with each lap. Apparently he got faster after taking a 10min loo break to relieve himself of the gas that has built up. The freed bowels along with the pent up frustration seemed to have made him tremendously faster. When I came back from my short nap break, I was surprised to see the renewed energy in him but it also saddened me further that he is going to come much closer to his target and ultimately fall short of it. At the start he needed to complete 232 laps of the 50m pool to complete the 11.6km swim. For the time available we calculated he needed to cover 47 laps per hour but the initial hour he fell short of it by about 10 laps. Now he was putting in between 50-60 laps per hour. I calculated that he needed about 45 mins more than the cut-off time to complete the remaining laps at the rate he was going. It was most agonizing as I kept mentally calculating and adding up the minutes he lost due the navigation errors and the minutes he lost as he stopped to eat a bite of banana or eat a spoonful of muesli every time he saw us by the roadside towards the later half of the ride. We could have saved much more than that 45 mins that he needed and it was excruciatingly painful to realize that. As Dipankar was fighting his battle against time fully knowing he was going to lose it, others were fighting their own battles. Judith Martin, the only female contender finished her swim in good time. Dave Kershaw who reached the pool just about the same time we got there was struggling with terrible cramps right from the start of his swim but kept going trying to relieve them with salt drinks. Towards the end he was taking forever to complete each lap unable to put the legs to any use but kept on going. He had to be helped out of the pool in the end. It seemed like the pain of the DNF was hurting him more than any cramps could ever hurt him. Rod Elder who started a couple of hours before us, was fighting his brave fight against the clock. He has slowed down towards the end and his crew had a nail biting time watching him complete his last lap exactly at 5:00pm right on the dot of the cut-off time. He eventually finished the run and the event in the shortest overall time among all the contenders but it was damn close as we cheered him on for every lap towards the end. Watching Dipankar and all these athletes fighting the battle against the time and their own bodies and minds was a truly remarkable and inspiring experience. The pool was closed at 5:00pm and Dipankar got out of the pool having done 9.5km of the 11.6km swim. He told Nick and I to pack up. But when he was talking to Dave Kershaw and was urging him to go ahead with the run just for the experience of it, I understood that he called off the run as he didn’t want to put the crew through the trouble for another 24hrs or so for a DNF. I told him that Nick and I are completely fine if he really wanted to run and we decided to take back the GPS device we returned to the organizers and give it a shot. After a couple of hours of rest in a McD parking lot, we started the run. He was running well for the first 15k but the pace kept falling as the muscles began to tighten up and we discussed and decided it was not worth it to risk a long term injury just for the experience and a DNF result. We called Chris Ette to inform him of our decision and he came and collected the GPS tracker and wished us luck. Nick had driven us to his home, fed us breakfast and helped us pack our bikes and luggage for our return trip. It was really great knowing and to be crewing with such fine gentlemen as Nick and Jonathan. They were incredibly supportive throughout the event. Although it was a DNF, the event has thought Dipankar and I, so much and the experience is invaluable in many ways. Knowing him, I’m sure he would come back better prepared and be victorious at the event, soon. I thank Dipankar for this tremendous opportunity to experience this incredible event from such close quarters being part of his support crew. It had been a great learning experience. I only wish I had done a better job in helping him get through this incredible challenge. For now, I can only wish him all the very best in his future challenges with an offer to do whatever I can to help! You can see a few more photos here. You can follow his adventures on his FB page or his blog. I was eagerly waiting for this report to get the details of the event, specially eager to know how a combo of experienced guys like Dipankar failed to meet the cut off. It was really painful to read the failings towards the end of bike leg and how the fight against time in the swim happened. But you got to admit that starting 12 and a half hours later than the flag off time was not a wise decision. Why couldn't you choose to start early and finish the bike leg and then catch some sleep before the pool opened? But then, such question would have already come to your thoughts, but the blog suggests that you didn't consider it at all. Anyway, I will not add further to your pain and bitterness. But it is really sad, not because he didn't finish it. It is sad because he could finish it! Opendro: In DP's words, to make it challenging! I know, it sounds foolish but his thought process is that he could complete the bike in much lesser time than the time allotted and starting early in it would only make the event less challenging. In retrospect even a 2:30am start would have given us a couple of hours more and could have seen us through..
^That Spanks needs a frikken beating. There's confidence and there's over-confidence… like those distances weren't challenging enough by themselves! Also, there are so many factors outside of his control–sure it's hindsight, but it's not as if these are hard to imagine… weather, errors, body trouble… Why not start on time and make the challenge to finish first? When reading the blog I assumed there was a good navigational reason for the choice–either darkness or weather. Nope. Although starting on Thursday evening would have added one more sleepless night it would have also given us enough time to sleep/rest before the swim. Overall time was the main reason for that decision afaik. Okay, then I'll just have to whip him when I see him next. If you look at the results, Rod Elder was the only guy who made it, from those who started on Friday. He just made the swim cut off. Just barely. Right on the dot. 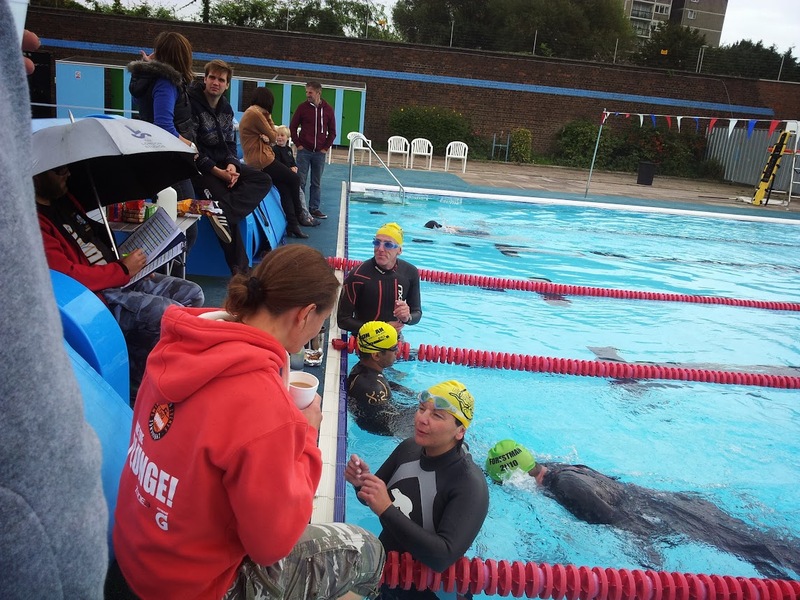 The three athletes who started on Thursday were much fresher by the swim time and were able to put in much better swim times and completed the event in relative ease(using that word connected to this event might be an irony). In retrospect the four athletes who started on Friday took a huge gamble by making the already challenging event more challenging. Three of them DNFed and one of them won. And barely! He finished on the top of leader board for the race but it only tells part of the story.